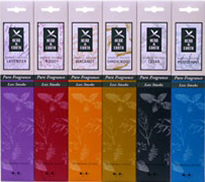 Herb & Earth incense sticks from Nippon Kodo are based on a thin bamboo stick core. These thin bamboo sticks create low amounts of smoke, which allows you to enjoy more of the pure fragrance used in this range of sticks. These are high quality, thin bamboo stick based incense.